The Cure RX5 is the largest putter in the RX Series with a 6" profile, center shaft design and a spiral milled face for improved feel and sound. The extremely high MOI Cure RX5 is fully customizable with a wide range of both weight and lie adjustability, you can easily dial in the perfect fit and feel to suit your stroke and tempo and change your setting anytime you wish to customize performance. 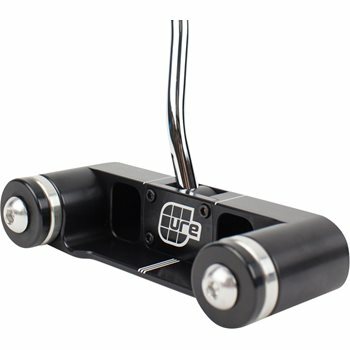 This Cure putter head is constructed Aircraft Grade Aluminum (T-6061) with a precision spiral milled face to produce a superior forward roll. Largest size putter in the RX Series, the RX5 has a 6" profile, center shaft and a spiral milled face for improved feel and sound.